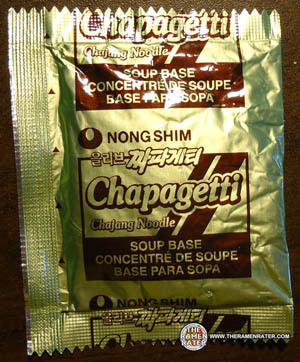 Here’s another well-known Nongshim pack – Chapagetti. 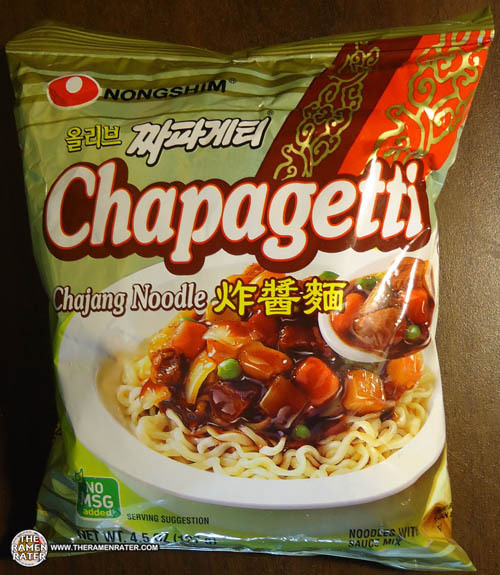 Basically, you take spaghetti and combine it with Chajang, which is a black bean sauce – now you have Chapagetti! 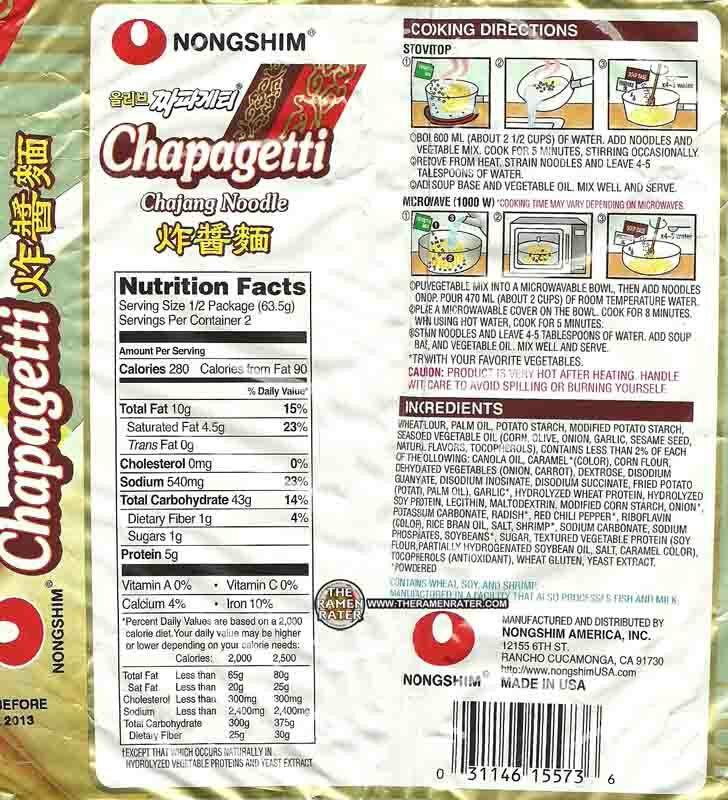 These noodles are of a wide gauge and mention on Nongshim America’s website says there’s 12% more of them than in other varieties of theirs. Here’s the stuff that makes the sauce. 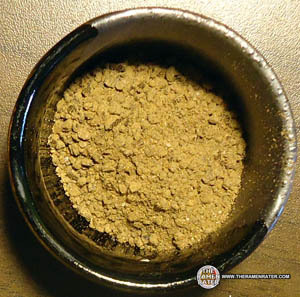 Different than most of the seasonings I’ve seen – this is very granular. Vegetable oil? Usually I’ve seen seasoned oil, but this is straight. 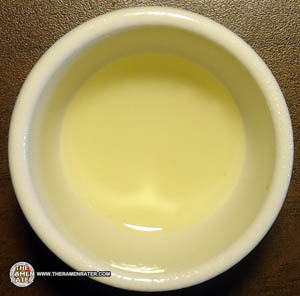 Yeah that looks like vegetable oil! An interesting looks little mixture! I looked in the ingredients and as it turns out, there’s potato and pork in here! Finished (click image to enlarge). Added some veggies. I distictly remember this being very dry the last time I had this and dry isn’t something that comes to mind here. 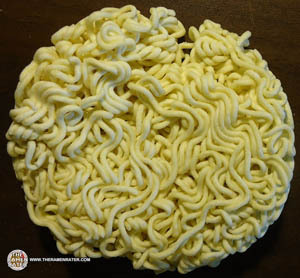 The noodles are nice and thick and the sauce coats them nicely. The sauce is rich; nice black bean flavor. 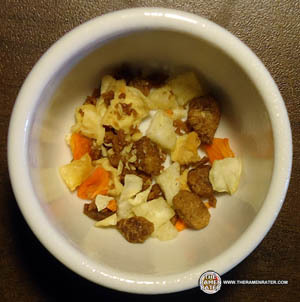 The veggies and TVP are great – the pork bits especially were enjoyable with a nice bit of chewy freshness. This was good – something I’d eat again. 4.0 our of 5.0 stars! UPC bar code 031146155736 – get it here. This entry was posted in * Meet The Manufacturer, * Stars 3.1 - 4.0, Nongshim, Other, Pork, South Korea, United States and tagged 0 31146 15573 6, 031146155736, 15573, 31146, 6, 98026, asian, asian instant noodle soup, bowl noodle, buckwheat, cha jang, chajang, chapagetti, chapaghetti, chinese, chow mein, edmonds, eggs, flavor, fried noodle, hans lienesch, indomie, instant noodles, instant ramen noodles, japanese, jjangmyun, korea, korean, korean noodles, lienesch, maruchan, meet the manufacturer, mi goreng, nissin, non, nong, nongshim, nongshim america, noodle, northwest, ponpoko, Ramen, ramen blog, ramen blogger, ramen rater, ramen recipe, ramen review, ramen reviewer, ramen reviewers, ramen reviews, ramen video, ramenrater, ramenrater.com, ramyeon, ramyun, rancho cucamonga, rater, rating, ratings, review, reviews, saifun, saimin, seattle, shim, shin ramyun black, soba, soup, spicy ramen, tanuki, tempura, thai, the ramen rater, the ramenrater, theramenrater, theramenrater.com, top ramen, udon, united states, usa, washington, wheat, wheat noodle, yakisoba on June 6, 2012 by Hans "The Ramen Rater" Lienesch. 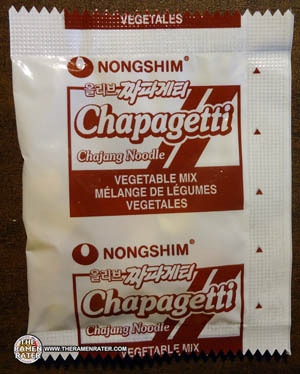 I still don’t see what are the health benefits for eating Chapegetti. Is it really a vegetarian’s dish? well, at least this one isn’t, it contains shrimp! I just gave this one a try, and was super disappointed, something that hasn’t happened with a Nongshim that I can recall. It had very little to no flavor- I thought my taste buds must be broken, so I had my husband try it and he thought the same. How weird! I don’t think I’d get this again, and ended up tossing what was left and whipping up some Spicy Tonkotsu instead! 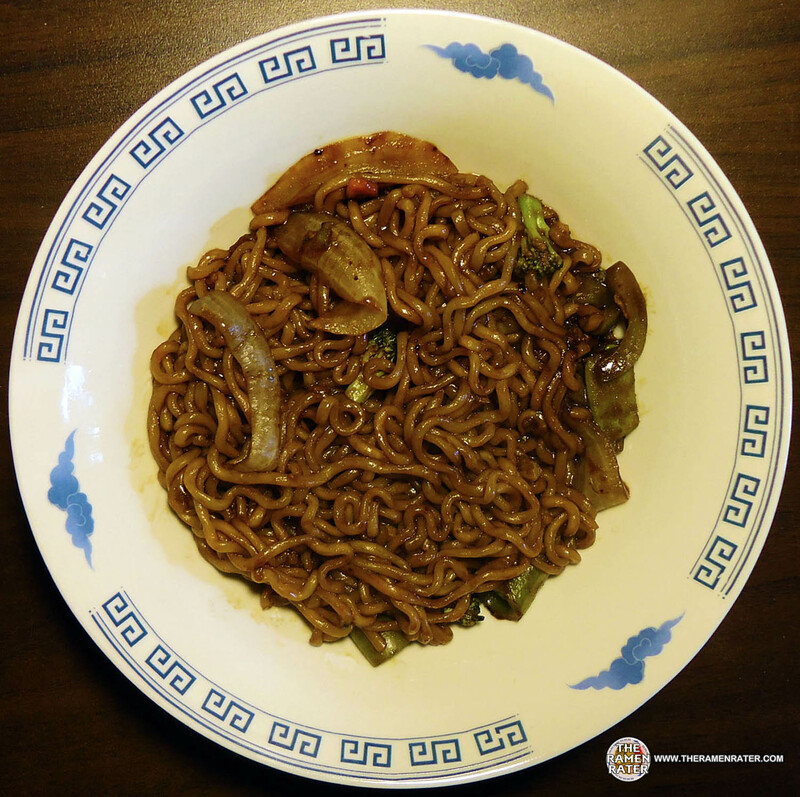 Yeah jjajangmyun is definitely not spicy – nor is gomtangmyun, a creamy beef one. Are those really pork bits?? 🙁 i dont find any pork in the ingredients. It just says “Texturized vegetable protein (TVP)” which is made of soya beans. I bought the product in Indonesia. Im waiting for your reply. Thanks! Yeah no – definitely no pork in this one and I changed it to TVP in the review. One thing though is that this one is made in the United States and while I suspect the ingredients list is identical, I would advise looking at the version you’re getting which is probably from South Korea. Pork isn’t extremely popular in instant noodles there, so I would figure it a rare occurrence. Pretty sure there is no pork in this just TVP. The oil is lightly flavored…I tasted it. 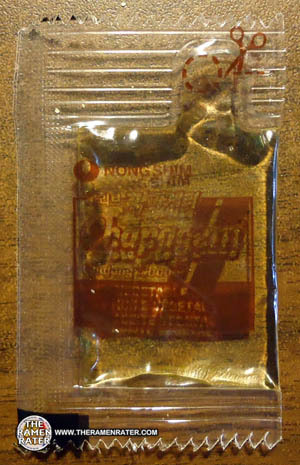 Kind of like the indomie mi goreng oil packet.